ControlReady includes ALL applications in a single program. We like to think of ourselves as the Southwest Airlines of the radio industry. Other companies charge you for each and every application module your station might need like airlines charge for bags. Those nickles and dimes really add up. 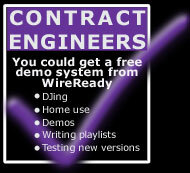 We don't charge extra for every single playout and recording function. With ControlReady, you get everything show below in a single EXE program. Upgrading is as simple as replacing a single EXE file. Why try to manage multiple separate applications and modules and pay for endless options, when you can buy a single product at a single price and have everything you need on day one. 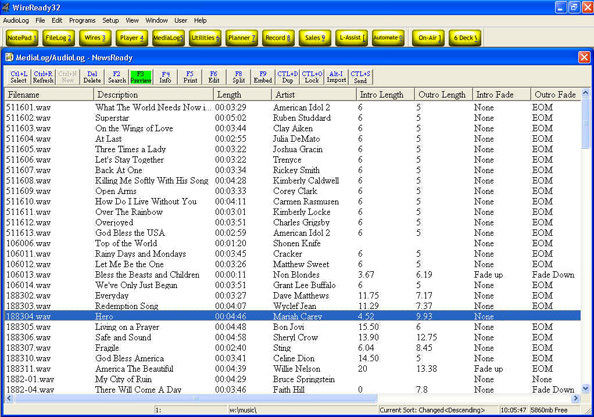 Nothing beats the ability to create stand-alone playlists to run your satellite, music on hard-drive or show schedules. Our decks are as powerful as true script programming sequencers, with customizable columns and fonts and a range of information levels to make it look engineering or DJ friendly. A deck/playlist is 2400 lines. 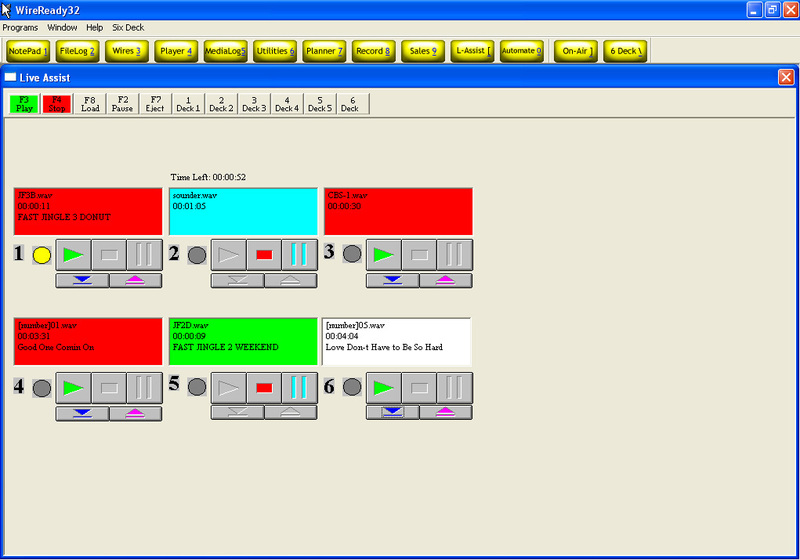 Run up to 8 simultaneous playlists at a time for playout, recording, liners and other activities. Some folks run more than one station at a time from one box. 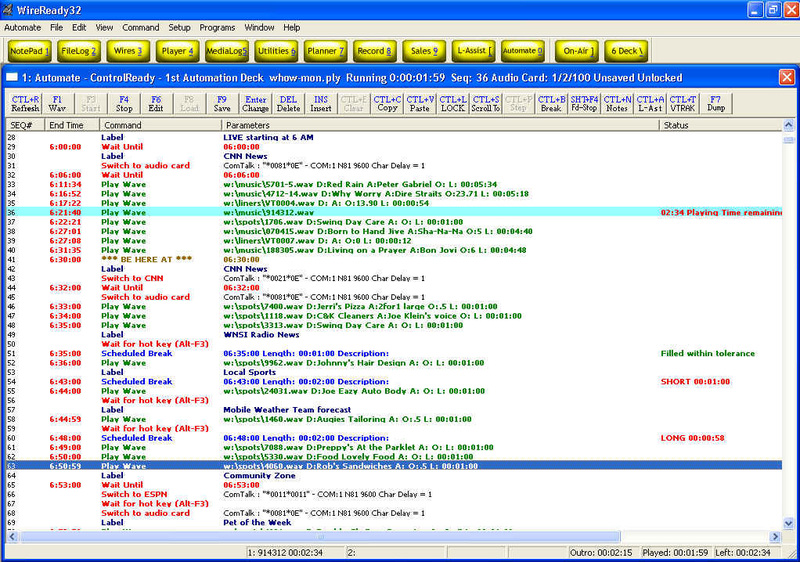 We have over 50 commands that can play audio, control switchers, wait for closures, send emails, update your web site, drive prompter screens for reading live copy, and more. The decks can automatically import music and traffic logs separately and it's even possible to generate entire playlists, logic and all, from vendor export files. Playlists can be run from the automate decks or from the DJ-friendly live-assist screen. This virtual live assist console application sits on top of our highly regarded log-based automation application. You can now toggle between the raw log and the live-assist view. 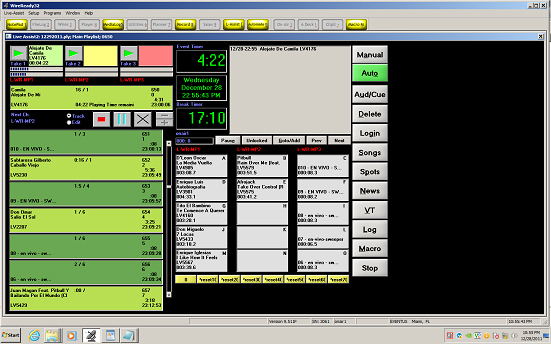 Every deck/button on this screen is contact closure, RS-232 and TCP/IP remotable too. We have one of the simplest voice trackers in the industry. Hit 1 to roll the end of the first song, Hit 2 to start recording your track, Hit 3 to start the beginning of the track which follows, Hit 4 to stop. Hit F3 to audition it back. Repeat until you like what you have. No complicated drag and drop graphical displays. Rely on the existing intro and outro settings saved in the song metadata to let the system automatically place your voice where it needs to (dry record) or you can configure the screen to let you be in control. Live timers act as a guide suggesting when to hit the 1, 2 and 3 keys. Use the mouse or the keyboard to drive this screen. 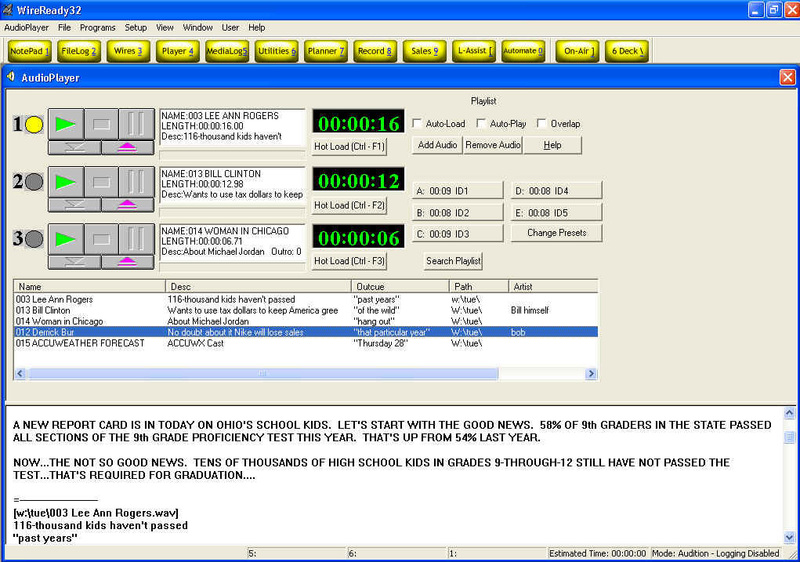 With a multi-channel sound card, voice track directly on the on-air computer while it's on the air. Or voice track on any production computer and our software will automatically sync your tracks to your on-air machine(s). A classic old-school screen that lets an operator have commercials or music set up in the decks on the left and hot buttons ready-to-fire on the right (mouse or keyboard). Define your own hot keys/numbers and mouse click combos to control how you play, stop, load, queue and more. Drag and drop is supported. This screen supports two audio channels, one for the left decks and one for the hot buttons. Another old-school playout screen that provides three drag and drop decks to hot-load and play audio files. Check boxes to automatically segue from deck to deck and even auto-overlap using cross points stored in the audio file metadata. Hot buttons on the right keep legal ids or liners handy. Drag and drop quick playlists to do simple automated sequences or drag and drop individual files into any deck on the fly. Load scripts (text files) into the screen in case you need some copy handy to read on-screen. This screen supports up to 4 independent sound channels allowing separate faders for each deck and the hot buttons. Have a challenged operator or someone with super simple needs? This started as a training screen but it turned out to be popular with everyone. This screen's virtue is the simple limited nature of it: 6 virtual cart decks. The only thing it lets you do is load files into any of the 6 decks and play them one at a time. This is our enhanced directory viewer for sound and media files. Our built-in MediaLog screen provides operators with database-like features without the need for a complicated database. Set up your audio in pre-defined folder and subfolder areas or configure the system to browse anywhere. When in a folder, search and sort for audio, click to open in an editor or hit the Preview button to play. Hit the INFO button to view & modify metadata, audition the beginning and ends, edit overlap/voice track settings, and more. Automation includes our famous news word-processing and copy system. Within the same system, you can compose and manage all live-read information including newscasts, scripts and other copy. 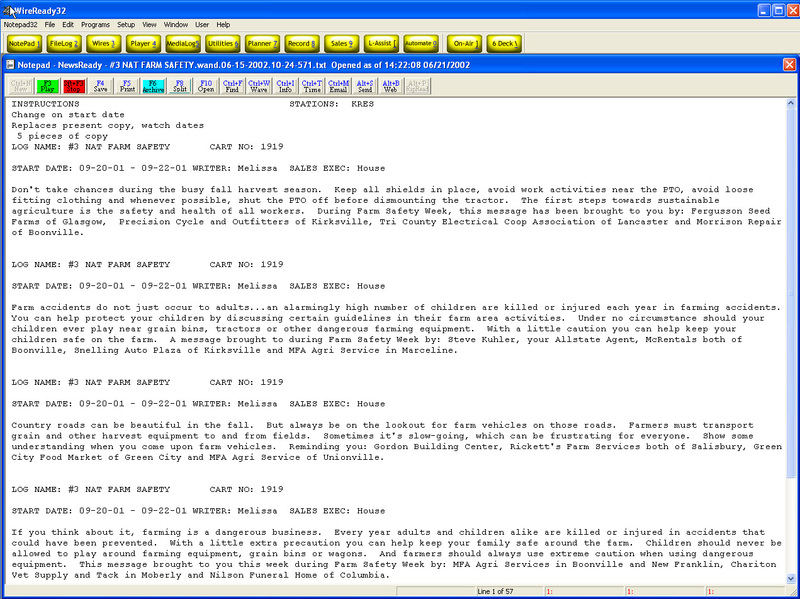 Coupled with the FileLog, you have one powerful copy management system without the need for separate software or a separate computer. When networked to other computers in your station, your air computer can read any newscasts and sound files coming from your newsroom all from within a single integrated application. This screen is similar to the MediaLog and does for scripts and copy like the MediaLog does for audio. 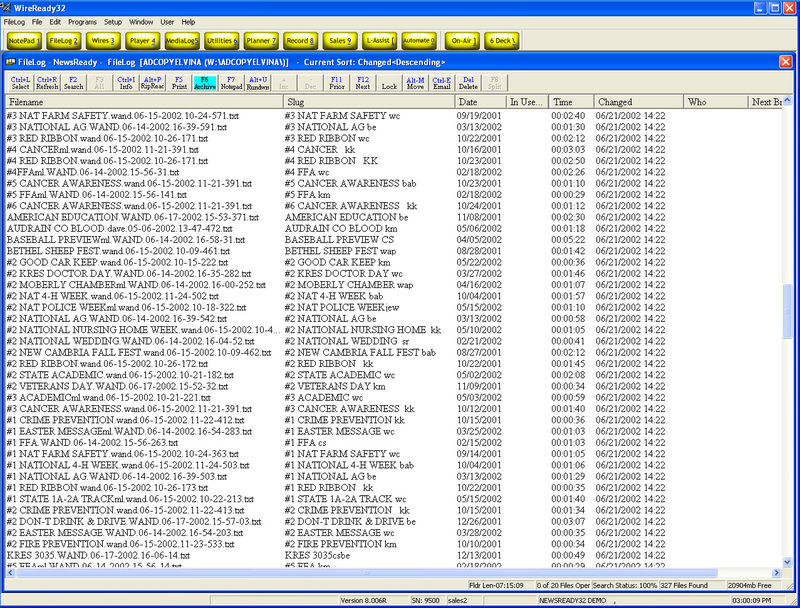 It's your organizer/search tool for managing, sorting and archiving all copy in the system. Yes, you get this screen too. There are lots of read announcements and other information that operators might need for staffed stations. 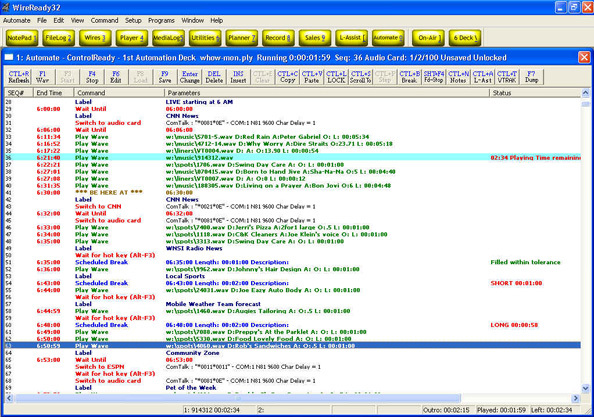 This program is similar to Outlook but built into our software, providing a multi-user compatible calendar that lets you save up to 6 categories of information days, months or even years in advance and retains anything the operators type in the days for historical reference.